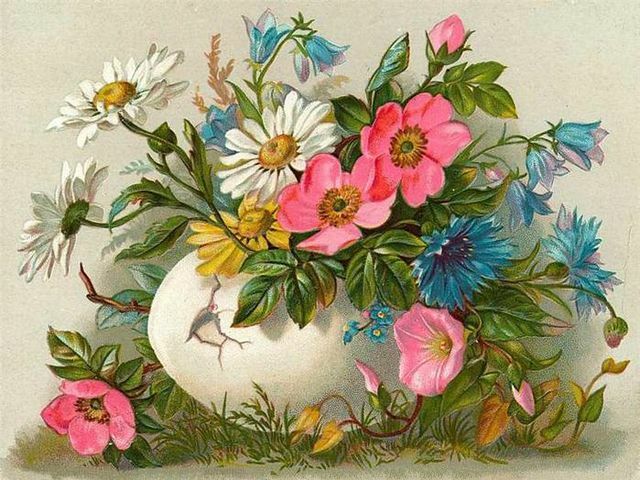 Greetings for a 'Happy Easter' with a lovely old antique postcard, depicting colorful spring flowers in a pot from shell of egg. The egg is an ancient symbol of rebirth connected to the spring, when the nature returns to a new life. The spring flowers, the new leaves, birds, chickens, lambs or other newborn animals are also symbols of Easter. The word ‘Easter’ comes from the name of Estre, an Anglo-Saxon goddess who was linked with the spring, fertility and the beginning of the new life.